Online casinos have been emerging left and right however many of them have failed to live up to their expectations. There are exceptions and one of those is the Rizk Casino. The site is licensed in Malta by MT Secure Trade Limited and is now available worldwide including Australia and New Zealand. 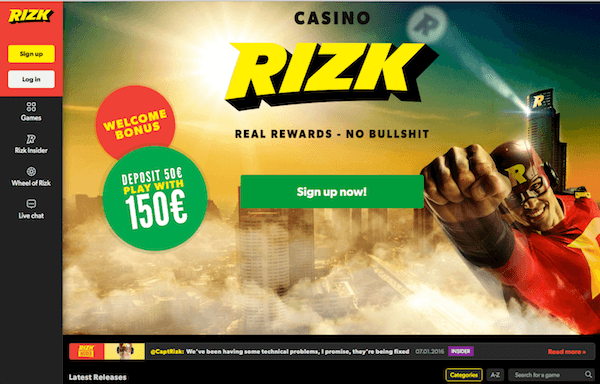 Rizk is a new online casino which is fully licensed and it is utilizing a platform created by Gaming Innovation Group – this is also the team behind the award-winning Guts Casino. With the brand being a newcomer, there is currently rather limited information about it, but it will prove to be an interesting new addition to the global market. 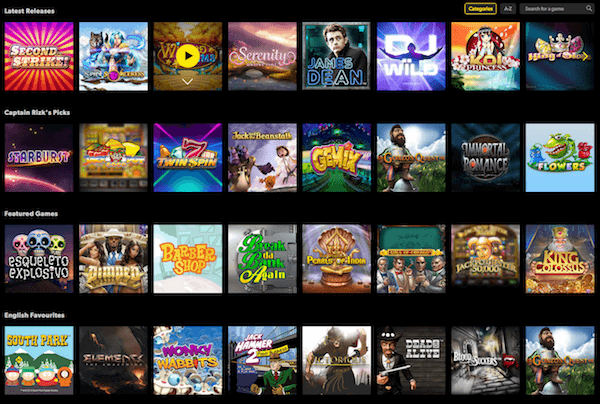 Thanks to the partnership with GIG, Rizk is able to bring pretty much all industry leading software providers on board and offer more than 500 online pokies. Good games are obviously the very core of any online casino and some of the beauties that Rizk has in offer are pokies, roulette, blackjack, video poker, baccarat and various table poker variations. We know that games from Microgaming, Net Entertainment (NetEnt), PlayN’ Go and ThunderKick are already included in the squad. This means you will be able to play both new and old pokie favorites such as Starburst, Dead or Alive, Jack Hammer, Twin Spin and Spinata Grande. All new players can claim a generous 200% first deposit bonus. Pay $50 into Your casino account and you’ll start with $150 – $100 complimentary from Rizk Casino. You will need to wager the bonus amount 40 times before a withdrawal can be requested. 200% up to $100 Play Now! Deposit $50 To Play With $150! For Rizk Casino, players from Australia and New Zealand can make deposits and withdrawals using the most common methods used within these countries. Deposit methods covers common platforms like the MasterCard, VISA, Neteller, Paysafecard, Skrill and other platforms that are permitted by the Australian and New Zealand national laws. Withdrawals can be made through Skrill, Neteller and Bank Transfer. Most of the pokies offered by this casino can also be played on mobile devices and tablets. This includes a full suite of NetEnt, MicroGaming, BetSoft, QuickSpin and Thunderkick titles. Customer care service is highly essential in any line of business and online casinos aren’t an exception. With Rizk the expectations are that the service delivery will be of high quality and this implies that gamers can have their issues sorted out within a short period of time. One can make contact with the Rizk casino via phone call, email or live chat. Of the available modes, the trend is that live chat is becoming the most viable option, as it is possible to receive prompt and highly effective solutions. In other words, you only need to activate live chat when you’re logged in and you will be assured of getting help with any of your questions or problems. You can also find help on the FAQ page which presents answers to the most common questions that the Rizk support team does get. By using this site, you will not need to contact the support team at all times as everything has been lined up well. This casino is a clear winner, which was the case with Guts as well. We aren’t certain yet whether it is owned and operated by Guts.com or they are simply providing their technology to some other group. Anyhow, it’s always nice to see a fresh view on how an online gambling site should be operated. 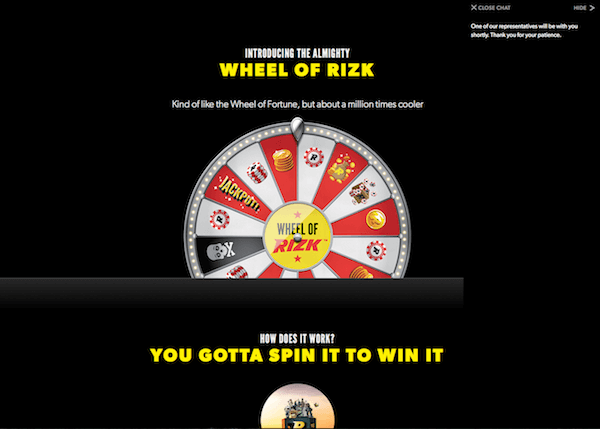 Sign up to www.rizk.com now and claim Your 200% match bonus, plus spin the Rizk wheel for an instant prize, or a shot at their very own progressive jackpot payout. Deposit $50 To Play With $150 >> Play Now!